The Cotton Bowl was the most anticipated bowl game outside the College Football Playoff. Prior to the kickoff, the ceremonial coin flip was conducted by the owner of a local car dealership. The highly anticipated Cotton Bowl, between arguably the two best teams not in the College Football Playoff, kicked off on Friday night, but not before a controversial coin “flip” started the affair. As Ohio State and USC, the champions of the Pac-12 and the Big Ten conferences, prepared to meet in the Cotton Bowl, the pregame ceremony was conducted with a guest coin flipper. The ceremonial coin, with the two schools’ logos on each side, was to be flipped by Gail Ewing of Ewing Buick, a local automotive dealership. 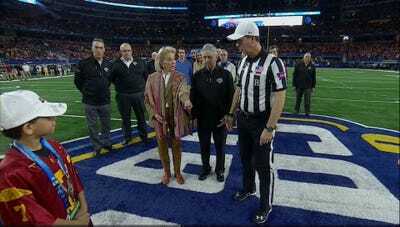 Not only did Ewing look confused by her role in the procedings, the coin never flipped. It was handed to her with Ohio State’s side up, and that’s what landed. Not a great start to the evening.